Belle Isle FL is a great community in Orange County FL. The community is situated by the airport area and is close to the Orlando International Airport. 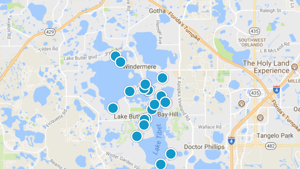 The community is by Lake Conway and is close to all that Orlando FL has to offer. This area has a variety of homes styles with Single Family estate homes, to old fashion, Spanish style homes in the community. Some homes are located are lakefront homes and give access to Chain of Lakes by Conway. This is a popular area for people to call home. Many of the homes are lakefront and the community offers Perkings Boat Ramp to launch your boat and Swann Beach offers a park, swimming and it overlooks Lake Conway. Call the Petridis Team if you want to see any of these homes. Nela Isle Island Sec SubDv. Belle Isle Pines Unit 01 SubDv.